I have just received a nice new shiny set of Delkevics to put on one of the '79s. The other bike still has the original exhaust on it so I can do a good comparison of the two exhausts. Whilst I was not really expecting an exact copy, I was expecting a lot better than I got. The right hand exhaust set is fine. The left isn't. On the originals there is an indentation for the centre stand arm. This isn't present on the Delkevics and they have made the prop that the centre stand sits against when up longer to compensate, so the centre stand arm isn't tucked away as well as you would expect. However the real issue is the side stand prop. On the originals it is on the "inside" of the pipe, that is towards the frame. On the Delkevics it is on the outside of the pipe and is much bigger than on the originals. To be frank it is just plain UGLY! Be warned if you are after replicas, they aren't quite there. Still look heaps better than the old set they replaced though. Thanks for the quick review, Tony. Have you had a chance to ride the bike for a seat of the pants power comparision. The set that i heard run through the gears had a terrific sound...very similar to stock to my ear. It didn't occur to me that I needed the two gaskets that pipes 2 and 4 need to connect to the rest of the set. So I am waiting for them to arrive. I have gone back to the people I bought them off asking what they are prepared to do as the goods really aren't "as described" although to be fair it isn't the retailers fault. So I'll wait to I hear back, but what I may do is take them to a guy I know who is good at metal fabricating and get him to fix the two props and get the pipe re-chromed. If I do this I won't start it up until after it is fixed so I don't have any issues with the chroming guys and contaminating their tank. I am having a slight discolouration problem with the No. 1 header, not blueing but going slightly black, on my Delkevics. They sound brilliant on the bike but I like you am not overly happy with the finish, I will contact Delkevic when I have checked the plugs etc, but she is running sweet at the moment. p.s. yes I will post a pic when I get time. Grey-haired bikers don't get that way from pure luck. Well...I can't really make a substantiated judgement about the Delkevic exhausts, because I have never seen one in real life. But I can speak based on my own experience from other industries and products: You have to consider that they come out of China and one thing China does not measure up with is Quality Control. They can copy designs, they have cheap labor, they can still do things there that we can no longer do in the "Western World" because of government and environmenatl rules and regulations, but they have an absolute inefficient quality control. You reject a part because of a defect and next week, you get a shipment of parts with the same defect. That's one of the problems with off-shore sourcing. You get a pipeline that's 6-weeks long! A real booger. Joner, I'd think the black would be either an exhaust leak or chrome coming off. Check the flange for a hair-line crack. RE5Guy wrote: I have just received a nice new shiny set of Delkevics to put on one of the '79s. The other bike still has the original exhaust on it so I can do a good comparison of the two exhausts. I wrote to Delkevic about this and this is what they had to say. They included a pic of their left side pipe next to an OEM pipe and frankly its a bit dark to really tell any difference but at least they didn't ignore my inquiry. When I get home I will see if I can take a photo and paste it here. as promised here are some pictures of my two bikes with the two exhausts mounted. What are peoples views? Are the pipes Delkevic supplied come from a pro-link maybe??? In re: "Are the pipes Delkevic supplied come from a pro-link maybe???" Their ads state they make one set for all CBX years which means there is no center pipe between the cans and no internal differences?. But, they may have modeled the exterior of their repros (only) after one model (79 or 80) or another (81 or 82). I have the OEMs off the 79 currently but the 82 has the OEMs on. Never noticed any difference between the exterior of either pipe where the stands go but I've never fitted an early model exhaust on a Prolink either to see if the stands line up the same, or not. Just took a look at mine, the HMMA2 A on my 82 has the side stand stop similar to your bottom pic, one longish rubber pieced onto a raised brace. The rubber part ends up in front of where the front of the side stand leg fits up against the pipe. This allows the side foot portion (the part that your foot lifts) to snug up tightly against the pipe w/o hanging too far away from the pipe or too far down. The 422s from the 79 do NOT have one longish rubber side stand stop like the Prolinks. It has two smaller separated raised stops with rubbers quite a ways apart from eachother, quite different from the Prolinks. The other smaller indentation for the center stand seems in a similar position between both versions. I don't see an indentation in your bottom Delkevic pipe like my 82 has. From the looks of the Delkevics in the bottom pic it appears they modeled them after the one on my Prolink. See the loop for your boot to raise and lower the stand? On my 82 the long rubber stop (like yours) fits in front of the larger side stand leg (when up) and on top of the smaller loop. I can't tell from your pic if the rubber stop is completely against the stand in the up position or not. Does your stand fit snugly up there behind and against the rubber or does it stick out or hang away from the can in the up position? 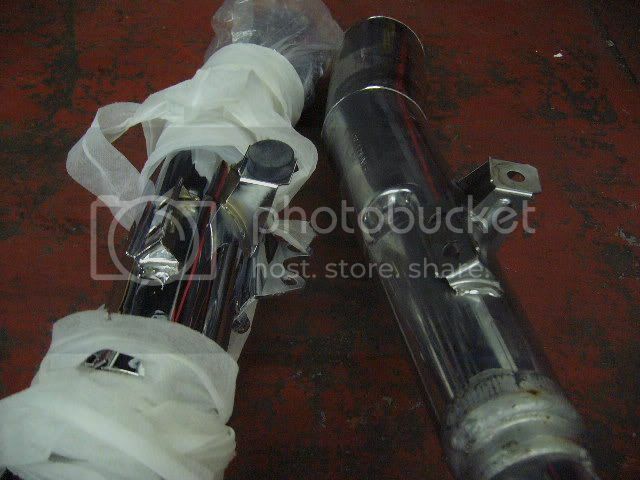 Here is a comparison between the different CBX exhausts. From bottom to top: 79 -422- exhaust, 80 -469- exhaust and 81/82 -MA2- exhaust. Clearly visible is the difference in stand stops, in spite of the -469- missing the rubbers. The -422- has two round rubber stops and short bracket, the -469- is a hybrid between the -422- and -MA2- with a round and a rectangular rubber and a short bracket, while the MA2 has a round and a rectangular rubber and a long bracket. Now, compare this with the Delkevic and consider the location of the indentation and it may show that they patterned the outside after the -469-. Maybe. Decide for yourself. Getting more interesting isn't it? My side stand does sit up snug against the prop when it is up. The metal part of the stand that holds the rubber foot is the piece that sits against the prop. Cetainly looks like the Delkevics were modelled on the pro-link and there are significant differences between that and the 422 exhaust I have. Any chance of further comment from Dave Fisher from Delkevic? RE5Guy wrote: Getting more interesting isn't it? I initially wrote to this guy from ebay, and here is his recommendation that I forward my question to him. Terry I'm working on an answer to this for us. ..."our CBX system is as close to the original Honda system as we could economically produce & there is certainly no other system produced today that is as close." And he may be right! Terry wrote: ..."our CBX system is as close to the original Honda system as we could economically produce & there is certainly no other system produced today that is as close." If you straighten your sidestand, it will fit the stops on both pipes much better. It should tuck right up next to the pipe. If you look closely, you will see a bow in the stand. It should be perfectly straight. The Delkevics are copies of the '80 pipes, as I think EMS said. Looks like the stop should hit right if the stand is straight.